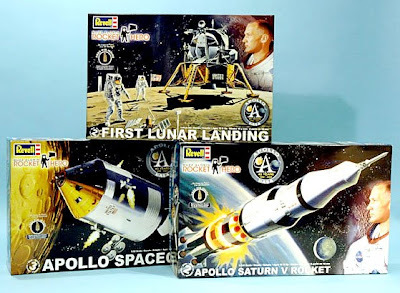 To celebrate the 40th anniversary of the Apollo 11 mission and the first manned landing, both Revell names have reissued some of their classic space kits – and here ‘both Revell names’ refers to the fact that the two divisions, while sharing the same name, are actually separate companies. Revell-Monogram in the USA is owned by Hobbico, whereas Revell-Germany is, in effect, owned by itself. 2 The Apollo Command and Service Module (CSM) and Lunar Module (LM) from the Saturn V, issued as a standalone kit. 3 1:32 scale Apollo Command-Service Module, with interior. This is the only mainstream kit to have the correct ‘Block II’ radiator pattern for the Service Module, and was originally a Monogram kit. 4 1:48 scale Apollo Lunar Module. This is an old kit and is really a model of the ‘boiler plate’ mock-up, but it still has a certain charm, and does demonstrate the folding legs of the Descent Stage. 5 1:8 scale Apollo astronaut on the Moon. This last item is the rarest of these five kits - the only previous reissue was in the Selected Subjects Program, SSP Phase 11, Summer 1995. Oddly though, the kit is now scaled at 1:8, whereas the original issue was 1:7. However, neither figure is exactly accurate as - if we assume it is meant to be Neil Armstrong - the scale works out to nearer 1:7.5. 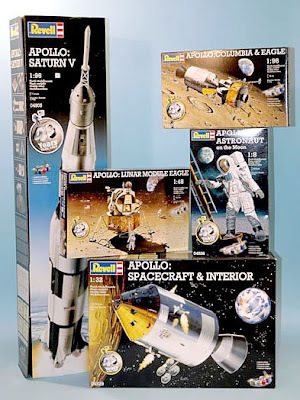 Revell-US - still just about ‘Revell-Monogram’ - has reissued just three kits, each tied into ‘Buzz Aldrin Rocket Hero’ sponsorship. These are all Monogram originals, but now carry the Revell logo and each includes a replica of the olive branch ‘Peace Pin’, left on the Lunar surface. 1 1:48 scale ‘First Lunar Landing’ is the most accurate of all Lunar Module kits made by the mainstream model companies. The nicest part of the kit is that you get a diorama base with a ‘shadow’ of the LM built in, figures of Neil and Buzz, plus all six pieces of equipment carried to the Moon by Apollo 11. 2 1:144 scale Saturn V launcher. This is the same scale as the Airfix kit, and is of course also a standard ‘airliners’ scale. Unfortunately, this time it has some wrongly-printed decals. The ‘USA’ and ‘United States’ for the S-1C and S-II stages are printed in black, instead of the correct red. It is very unlikely that Revell will be making corrected decals, but aftermarket sets, containing all these marking and many more besides, can be obtained from Rick Sternbach’s Space Model Systems, or Tomas Kladiva’s New Ware. The decal error also applies to the ‘USA’ for the third, S-IVB, stage, but as these were not actually used on the manned launchers, the wrong colour here is a bit irrelevant. 3 1:32 scale Apollo Command-Service Module (CSM). This is the only kit shared by both companies, although, as pointed out in the ‘All That Glisters’ post, the European issue does not have the Command Module either gold lacquered, or even chrome plated, while this American issue does. You can visit Revell-US here, and Revell-Germany here. Space Model Systems is here, and New Ware is here.